The Japanese famous electronic maker, Panasonic has recently announced its first mobile phone with Lumix digital-camera brand at Ceatec electronics show. Named as Lumix Phone, the phone is being designed to take high-quality photos as compared to its existing mobile phone models. In effort to meet this objective, the slider phone is being featured with several features such as 13-megapixel CMOS sensor, a mobile version of Panasonic’s VenusEngine image processing chip and lens with special reflected light suppression. Runs on Panasonic proprietary operating systems. 3.3-inch LCD screen with 854×480 resolutions. Mobile VenusEngine image processing engine for high quality images. 13-megapixel CMOS sensor with a high-intensity flash. Supports Wi-Fi, 3G and DLNA. 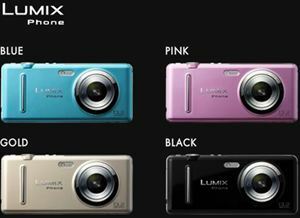 Available in black, pink, gold and blue, the Panasonic Lumix Phone with dimensions of 116×52×17.7mm and weighs 146g is expected to be available in Japan later this year. However, the price of the Lumix Phone is not yet announced.